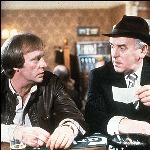 I was watching the The Great Trilby last night and I don't know how other Minder fans feel but when Arthur & Ray were in Australia I think a great twist to the story would have been meeting Terry and him helping them get away from the Aussie gangsters and back to the U.K, but with Arthur trying to wrap Terry around his little finger like he used to. Good point Yorkie (named after one of my favourite Minder characters, the wonderful and sadly missed Brian Glover), must admit that I had never made the connection between Terry leaving and going to Australia and then Arthur and Ray going to Aus, never seen this connection made anywhere either. I remember swainy telling me I think they missed out on a great opportunity with the Australia episodes and that I'm sure that Arthur would have looked up Terry. Even if Dennis Waterman didn't want to appear, they should have at least mentioned Terry in one of those episodes. I agree with this, I think in reality there is no doubt that Arthur would have looked Terry up. I think in the new Ray Daley series though, all mention of Dennis Waterman was being left out intentionally after the first episode to give the Ray Daley a fair crack of the whip. I quite like those Australia episodes and it's certainly fitting they went there to film, particularly as Minder is so popular down under! I've just watched the Australia-set Minder episodes and it never occurred to me either about Terry being out there. It would have been good to see Arthur and Terry back together, even if only briefly, but I doubt Dennis Waterman would have agreed to appear. It may also have been unfair to Gary Webster, as DW guesting might have had fans calling for the original pairing of Arfur and Tel. The sad thing about this first part of this trilogy is the unseen departure of Morley, Field and Gloria. George Cole is a little negative in his comments on the DVD commentaries about going down under. Personally I like this trilogy and think the idea that the only way to get Arthur off the manor is the thought of a major cash windfall. It looks to me as if they possibly started filming this series in Australia before returning to London to shoot the rest. Emma Cunningham looks particularly lovely in this one too. This was a great episode, particularly liked the 'seen it all' private detective from Australia come over to help Arthur. Initially, I thought that Arthur was going to lose his claim to the inheritance after it seemed as though Morley had him bang to rights, but good old Fields. Also, wasn't Dennis Waterman performing in Australia when they were shooting there? I never thought of this, it would have been great to see Terry back on our screens but no so for Garry. Even if they'd just gone to look Tel up. I still can't believe I never made the connection of Terry in Australia, right I'm off to boil my head. I caught this episode on ITV4 the other day and was intrigued about the break in at Gloria's flat. Gloria phoned Arthur at the lock up looking for Ray and obviously Arthur forgot to pass the message on. Eventually he did tell Ray and said that 'plod' were dealing with it. Is it my imagination or did they cut out a bit where Gloria had a go at Ray about his lack of response? Or did I possibly commit the cardinal sin of nodding off during an episode of Minder? It must of been cut. There is a scene where Ray walks in on Gloria who is having a drink with Field where she does moan at him. Thanks Swainy. I didn't think I was going mad. It'll give me a good excuse to rewatch it on DVD tonight (Australian release). I remember not liking this episode much upon first transmission, but I did enjoy it more this turn around. I liked the way Bill McCabe was following Arthur around until he caught up with him at the Winchester, where upon initial enquiries Arthur tries to avoid him, but on hearing of a potential legacy, appears from behind the post. Also Arthur trying to track down his family tree and then berating the lady for only getting mixed results. I think the actress who played this character may have appeared in another Minder episode, or maybe some other series. The farewell party at the Winchester was a nice touch also. When Arthur wants Ray to get his car back, Ray says it will 'cost him an arm'. If my American ears heard if correctly. Is Ray's comment just a short version of it costing him an arm and a leg or is it part of rhyming slang I haven't heard before? Just short for an arm and a leg. I enjoyed this and thought it established the storyline of Arthur inheriting money in Australia very well. I still have to watch the other two parts of this three parter. Talking of cuts when a traffic warden finds the fake tickets seems a bit abrupt.Arthur just looks down and then it cuts.There were no adbreaks in my copy is it a longer scene? I think this is Gloria's last appearance. She must have found out about Ray's numerous other women! I think it was more down to change/money. Another nice little touch is when Arthur slightly tipsy after the party, and consulting his breif after being nicked by morely, and points to his tie and says "look its got kangeroos on it!" I like this episode a lot. As noticed by all there is a few departures of cast after this, however it's the start of the possibly the best story line of the Gary Webster years.